The programme will assist the RCVS to gain insights into the market and how it is evolving, allowing the College to develop a regulatory framework that is adaptable to 21st century technology, fostering and supporting innovation, whilst at the same protecting animal health and welfare. ViVet was inspired by the Vet Futures project research which highlighted concerns that ‘vets could miss out on developments in technology, such as genomic sequencing, if they fail to be proactive about grasping the opportunities’ and identified a pressing need for the veterinary professions to be proactive and demonstrate they ‘not only welcome, but are driving, innovation in animal health’. Technologies such as telemedicine, wearable or implantable devices, fast and low-cost genomic sequencing, big data and artificial intelligence present veterinary practices with huge opportunities for improving the provision of veterinary services and facilitating access to veterinary care. These new technologies may also provide a foundation for new business models with the potential to disrupt more traditional ways of running veterinary practices. Unless the professions engage with innovation and embrace change there is a real risk the role of the veterinary professional will be diminished or side-lined altogether. Foster innovation in the sector and encourage innovators to think about the veterinary profession, so as to put vets and vet nurses at the centre of innovations in animal health. Help incumbents and new-entrants navigate the regulatory landscape, ensuring high standard of animal health and welfare continue to be maintained. Showcase innovative products and business models to the profession, thus helping the profession to better serve existing clients and access new ones. 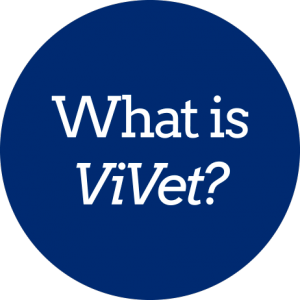 ViVet is run by the Royal College of Veterinary Surgeons, the regulator of veterinary surgeons and veterinary nurses in the UK. The programme is run by equine veterinary surgeon and RCVS Senior Vice-President, Dr Chris Tufnell and RCVS Director of Leadership and Innovation, Anthony Roberts.